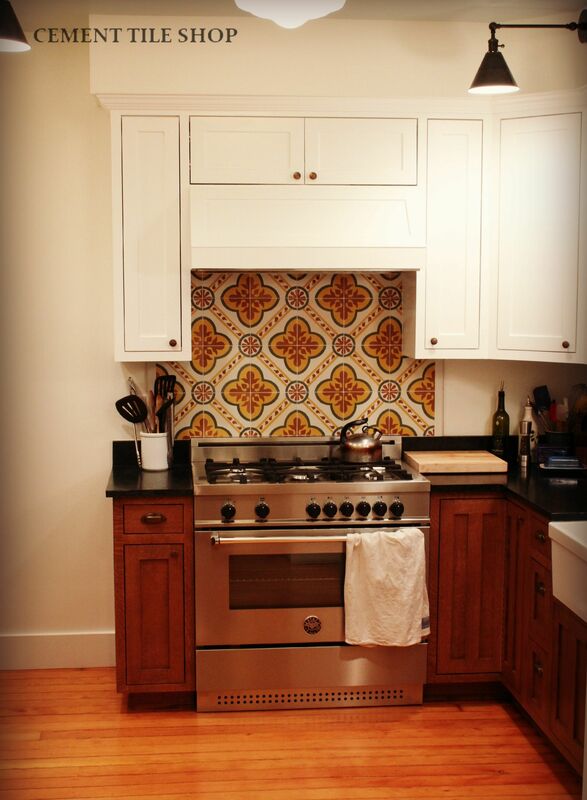 Sometimes we receive amazing photos from customers using our handmade cement tile that make you say wow! 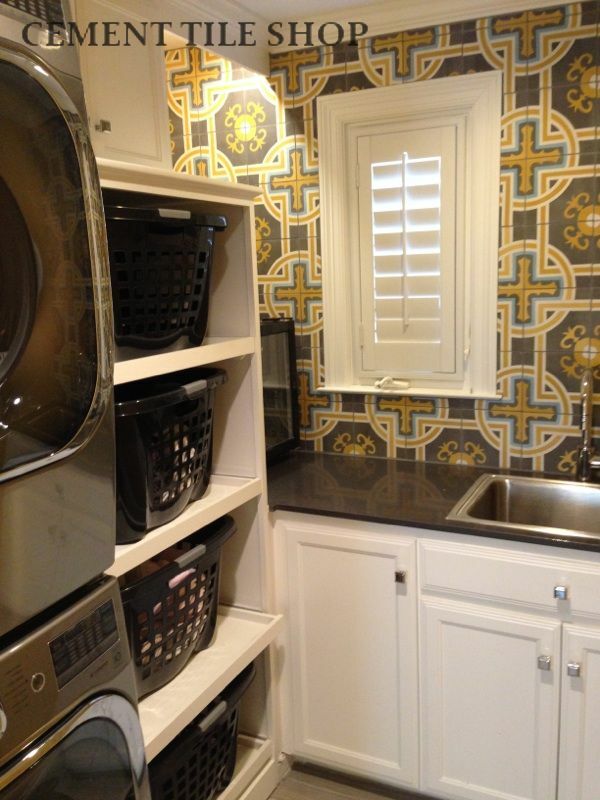 Laundry rooms, utility rooms and mudrooms are often a place to do laundry and hang up your dirty boots. They are typically devoid of any character and personality as we look to spend as little time in the rooms as possible. Our clients in Dallas, TX shared these great pictures that show what is possible in these small spaces with a little imagination. We would have no problem doing laundry if our room looked like this! 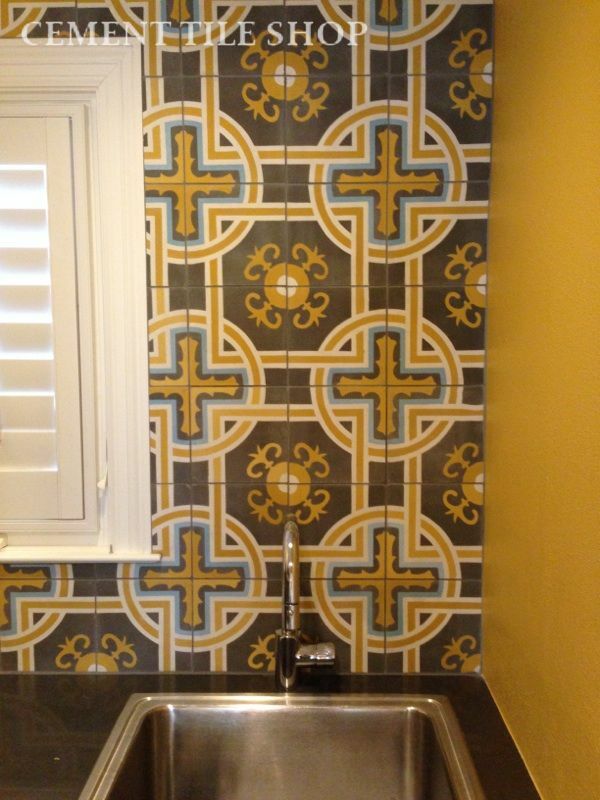 Our in-stock Sevilla Gold cement tile pattern was used as a feature wall surrounding the window and wash sink to create great visual interest in the space. 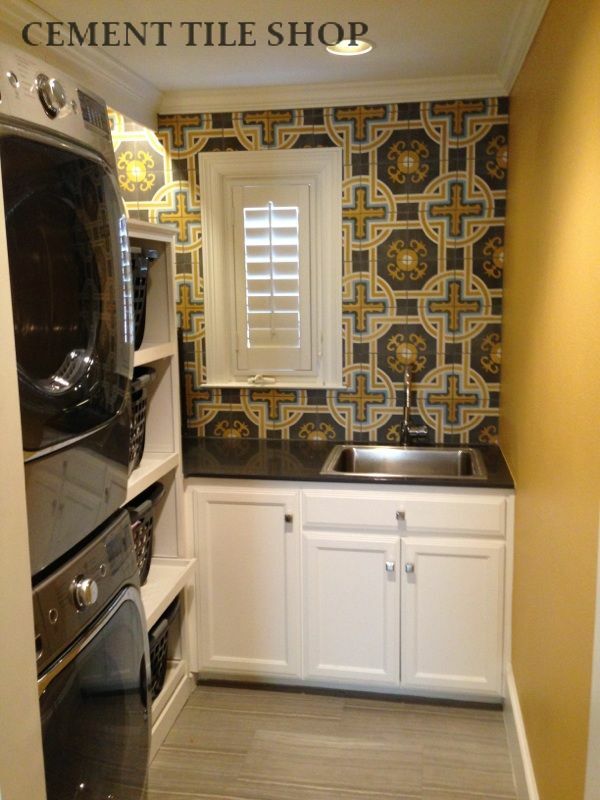 To incorporate cement tile into your laundry room or any other space, please contact Cement Tile Shop at 800-704-2701. Lane McNab of Urban Orchard Interiors in Berekeley, CA loves to create beautiful and functional spaces that have a sense of authenticity, meaning and character to the people living there as well as the home itself. 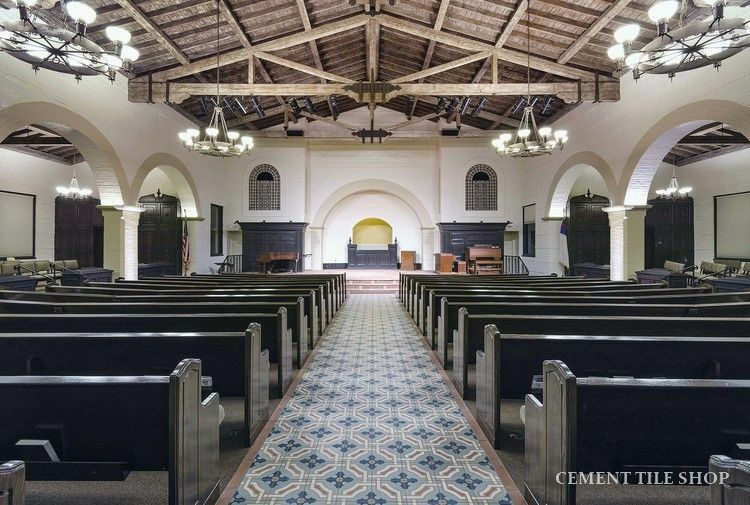 Lane was kind enough to share pictures from a recent installation of some of our handmade cement tiles. The craftsman house involved in the project is over 100 years old. It’s a brown shingle craftsman very typical of the local homes and the owners are bringing it back to life little by little. The owners are both wonderful cooks (she’s French so of course!) and spend a lot of time in their well-used kitchen. The home was updated sometime in the 80’s and was ready for a serious face-lift. 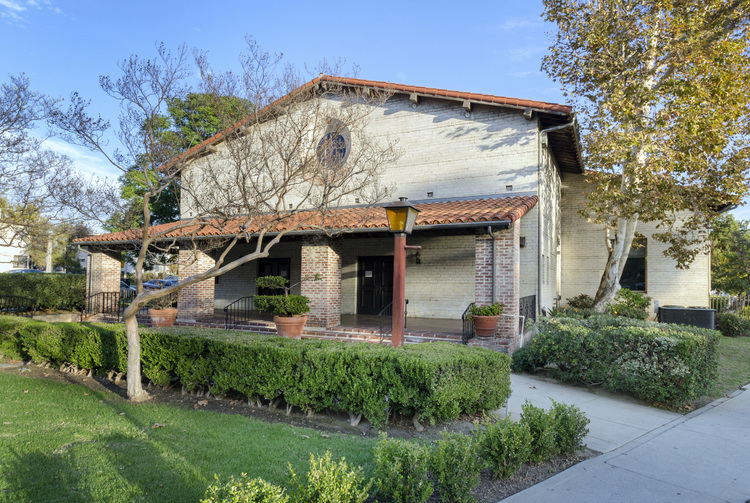 The clients wanted to incorporate a French/Moroccan style with the architectural elements of a craftsman. We think they succeeded! 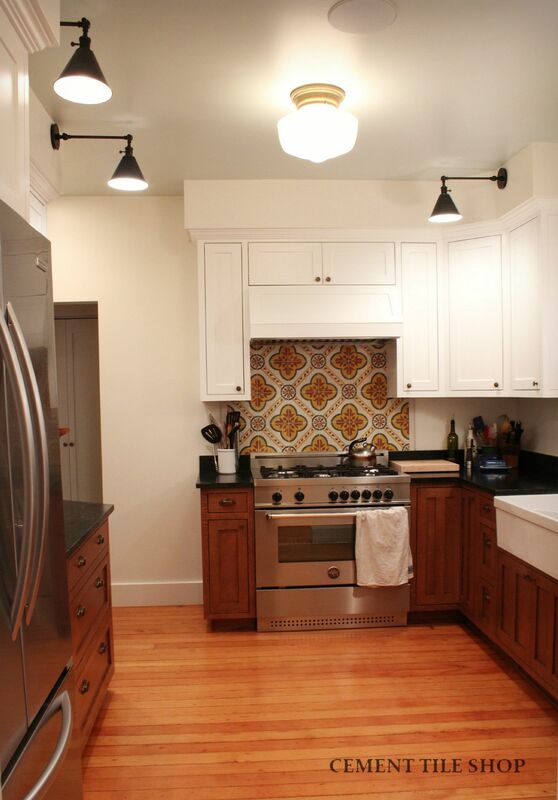 Urban Orchard used our Algeria cement tile pattern, in custom colors, to create a beautiful backsplash in the kitchen. 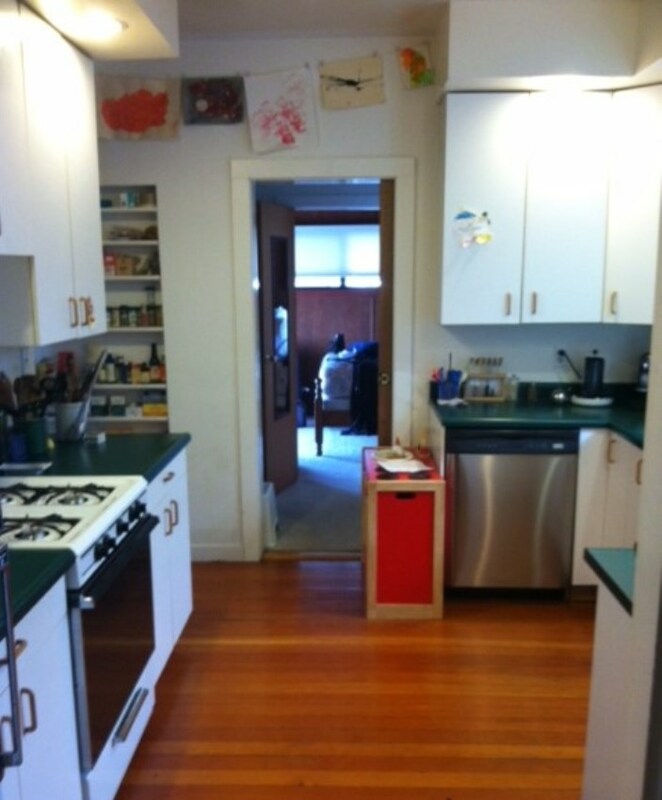 A doorway and closet were moved to make the stove and cement tile the kitchen’s focal point as you enter the room. We’d like to thank Urban Orchard for the pictures. Please check out their blog! 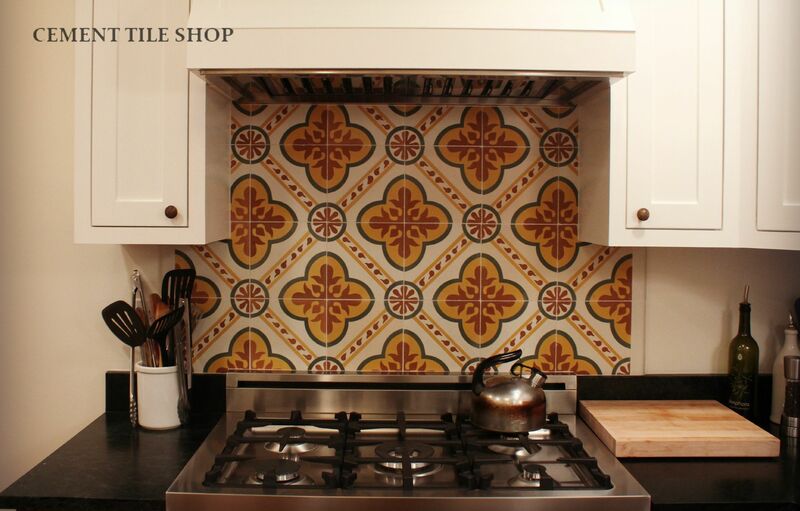 If you’d like to incorporate cement tile into your kitchen, please contact Cement Tile Shop at 800-704-2701. 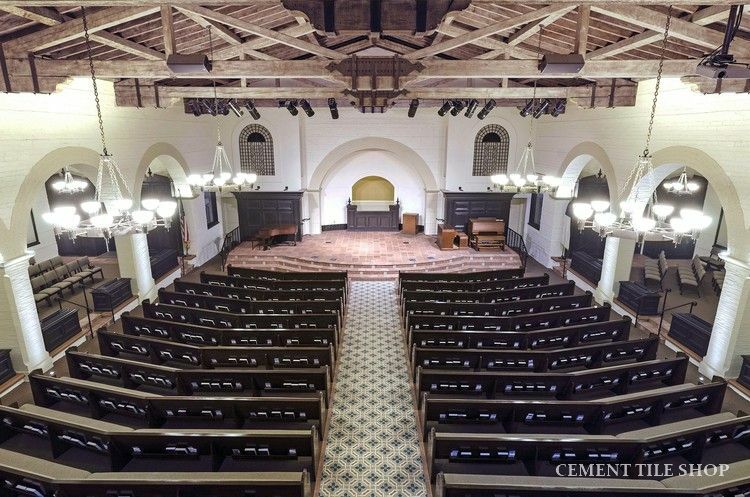 Our handmade cement tile was recently used at the beautiful Eagle Rock Seventh-Day Adventist Church in Eagle Rock, CA. The renovation project was designed by The Design Directive, based in Los Angeles. 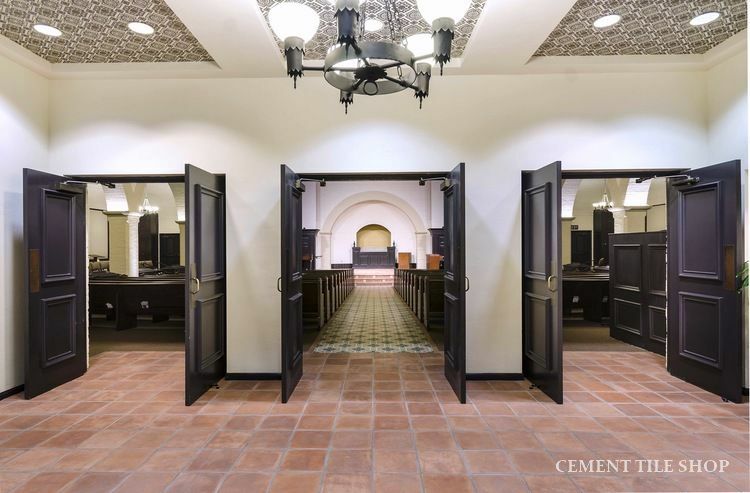 The handmade cement tile was used as the main aisle in the church, making a beautiful focal point as you enter the building from the lobby. 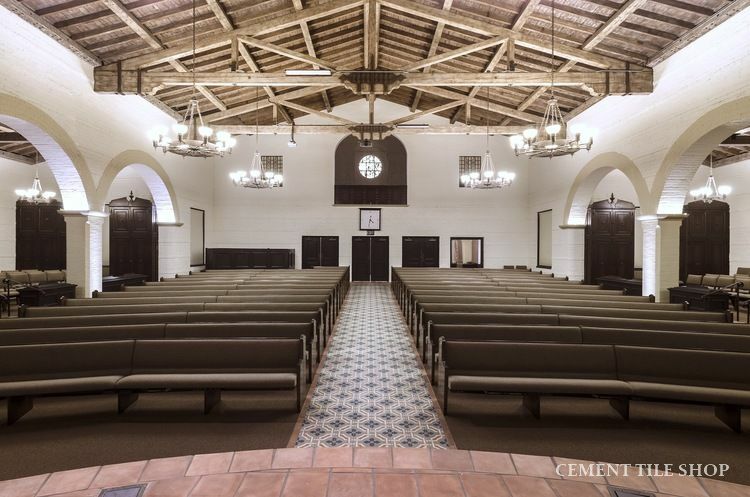 The Monaco cement tile pattern fits in tremendously with the Mission style church and looks like it has been there since the building was originally built. 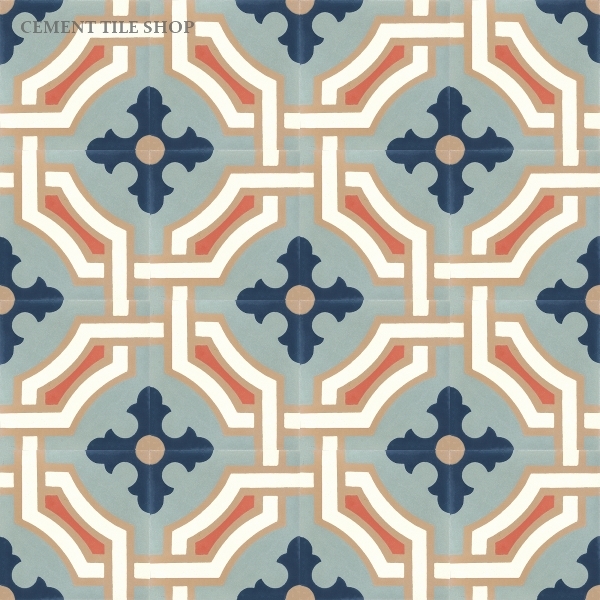 Contact Cement Tile Shop at (800) 704-2701 for more information or to incorporate this tile into your next project!